The simple phrase ‘it’s in the bag’ has the universal meaning that something desirable is accomplished and this sums up a Farmer’s Racer bag perfectly as a desirable object that has been designed with deliberation and crafted with care with a pleasing end result, both aesthetically and practically. 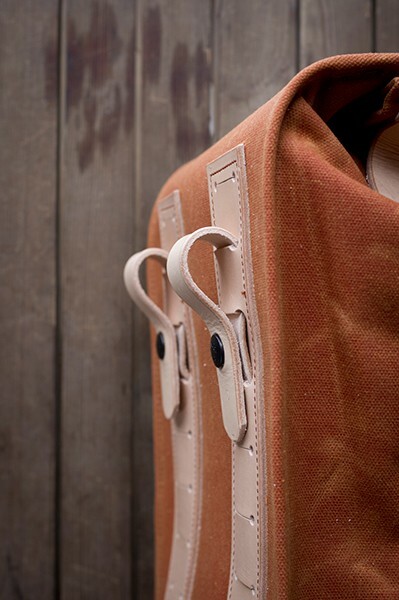 The universal appeal of a Farmer’s Racer bag has to be in its wholesomeness and the fact that it is simply well made. 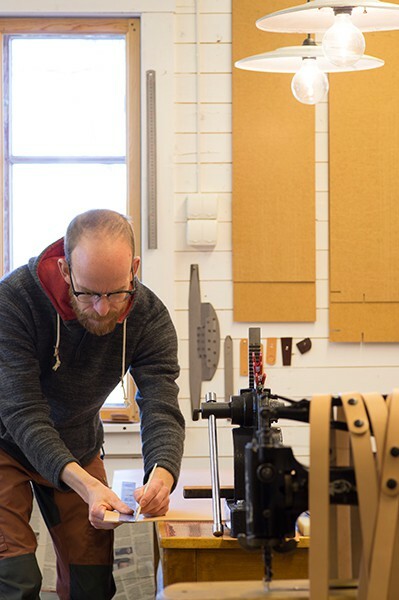 It has been crafted in an authentic & time-honoured way from local & traditional materials using vintage machinery without any pretence of fussy fads or transient trends to complicate the design and is the single-handed accomplishment of Lars Gustavsson. 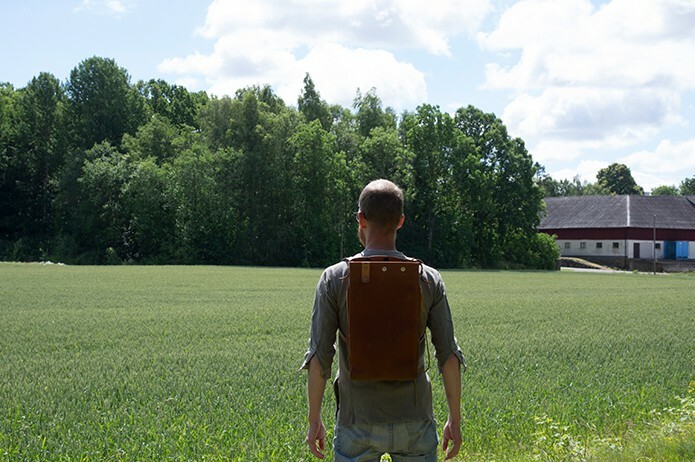 Lars is a modest, self-proclaimed ‘farmer with design knowledge’ who by returning to and reconnecting with his rural roots in Sweden has (re)created a modern version of an iconic worker’s bag which is now sold all over the world. 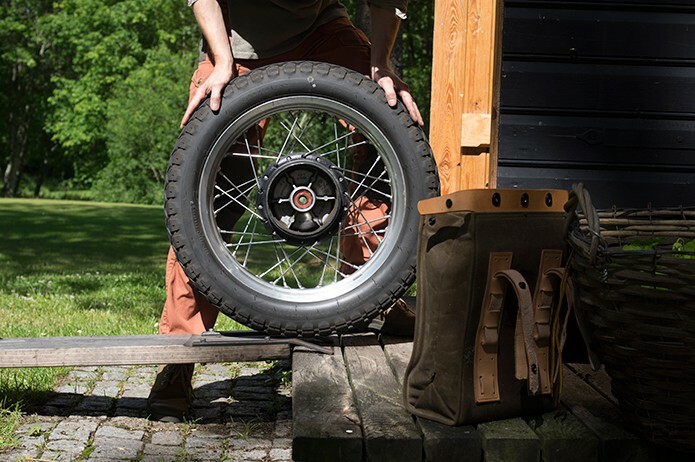 Here we are able gain an insight into the birth and evolution of the Farmer’s Racer brand as Lars explains in more detail the importance of the history & locality, materials & craftsmanship that makes owning a Farmer’s Racer bag so very special. Farmer’s Racer will be an unknown to many of our readers, and the name doesn’t give a lot away, so, firstly, can you give us an introduction to what Farmer’s Racer is and what the name means? 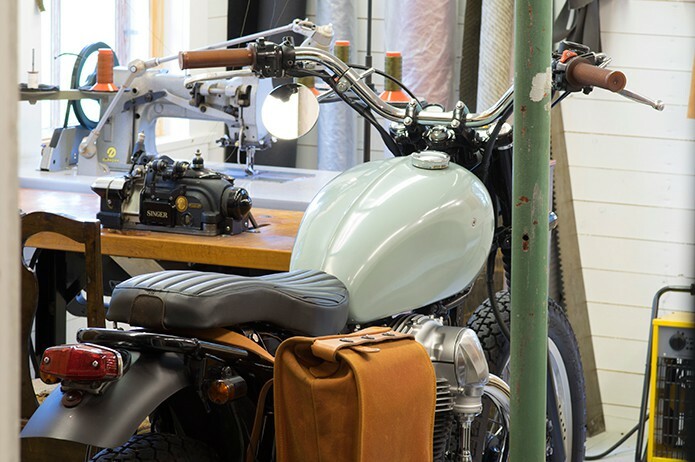 Farmer’s Racer is a one man craft company, making bags for every day use. Everything, from cutting patterns, to sewing and leatherwork, is done in a small workshop 5 metres from my house. The bags can only be bought on the Farmer’s Racer web shop. No retailers, instead I offer free shipping world wide. In this way you pay the same prize for a bag, regardless where in the world you live. A very local production reaching customers all over the world. The bags are made to last for generations and this is achieved by choosing the right materials, and keeping a slow process when making the bags. The brand name can actually be explained by looking at the black and white picture in the brand logo. The picture is taken by my father, Hans-Olof Gustavsson, in October 1969 on the small family farm. 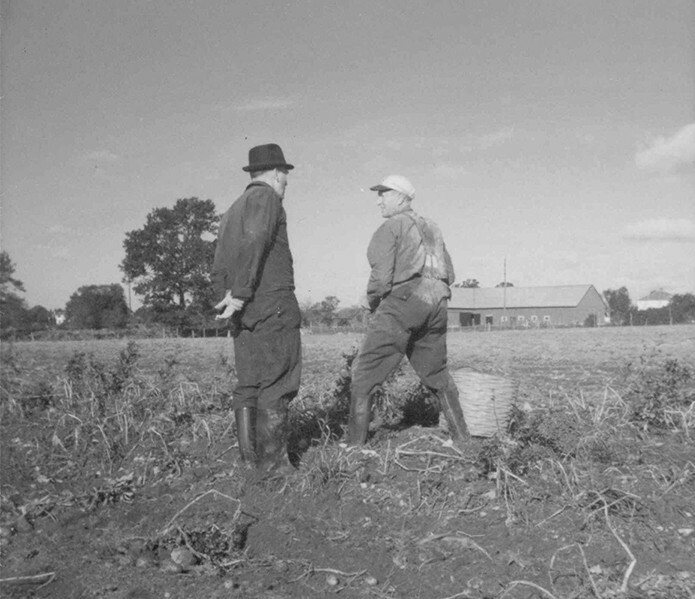 The man on the right is my grandfather on my mothers side, Yngve – farmer and carpenter. The man on the left is my grandmothers husband on my fathers side, John – from Stockholm. This was the only time they ever met. They talked about this meeting for the rest of their lives. In the background, behind the barn and the white house, is the very place of the Farmer’s Racer origin. The road crossing of the village Vida. This was the place to gather after a day of work in the field or in the forest. Farmers and farm hands brought their motorcycles and bicycles and racing was of course one of the goals of the summer evenings. Gravel roads and trails leading nowhere or somewhere became race tracks to dances and events in the surrounding villages. Still today, racing motorcycles is huge in the south east of Sweden. We host 4 elite league teams in speedway, and a number of champions in motocross. Most of these old motorcycles, used back then, were also a practical way of transportation – cars were too expensive. To be able to use these bikes in a practical way bags were needed. Top opening pannier bags were the most common choice. They could easily carry food, tools and some extra clothing for the coming days of work. The bags were used on all transportations, motorcycles, bicycles, tractors and wagons. They were made with such quality that most bags survived both the vehicles and their owner. I missed these bags when I started Farmer’s Racer. 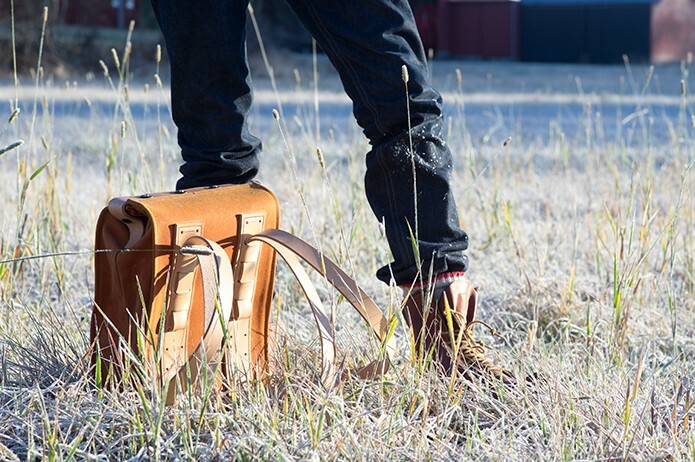 A bag to carry what one need in a rough way, to work or to wilderness. As a ‘one-man-band’ you are essentially Farmer’s Racer, can you explain what your background is and how that has inspired concept of a Farmer’s Racer bag? My background is a mixture of design, craft and farming. A bachelor degree in design is my last contact with organised teaching. I still use many processes common in the design field, but my main focus today is more leaning towards craft and farmer’s know-how. This twist started when I added the concept of sustainability to my design. I felt that I gradually used more and more of my farming skills instead of the more urban design-way-of-thinking. In many ways I hold my farmers title higher than my bachelor in design. As a farmer I have been taught to use materials and methods reaching over generations rather than years. The Farmer’s Racer bag is therefore a bag, made by a farmer with design knowledge, not a bag designed for farmers. I have a lot of interest in heritage and generations of use. I think it has to do with the shifting seasons of farming, and the forests surrounding the village. The trees planted by my great grandfather are now made into planks and timber. The trees I talk to and care for belong to my future grandchildren. It is in this context the Farmer’s Racer bag belongs, a bag worthy of inheritance. This long perspective has kept me away from the short trends of design. So, the brand Farmer’s Racer is unique in so far that you have no history or even connection with bag-making, but instead the ultimate end-product – ‘a bag’ – has been driven by a blog-turned-brand evolution, so a totally unique story of a crafted item. Can you explain how this ‘back-to-front’ journey has unfolded? It turned out that the blog had customers, but nothing to sell. 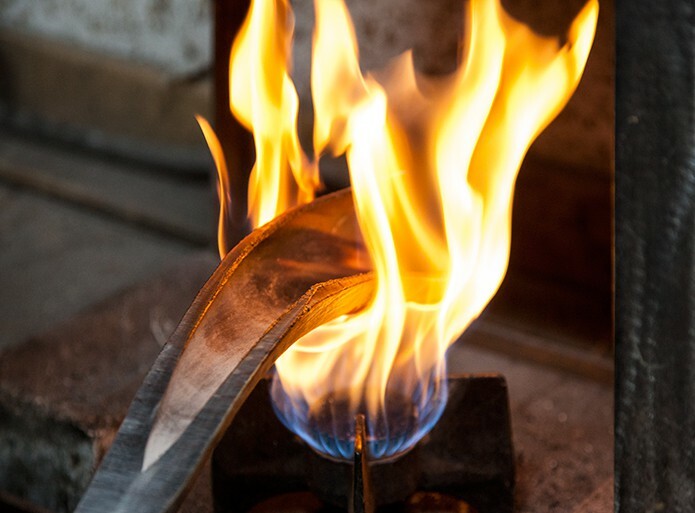 In this situation I could choose to start any workshop as long as the heritage in the blog were incorporated into the craft. I had a motorcycle, and I knew about the village road crossing story. 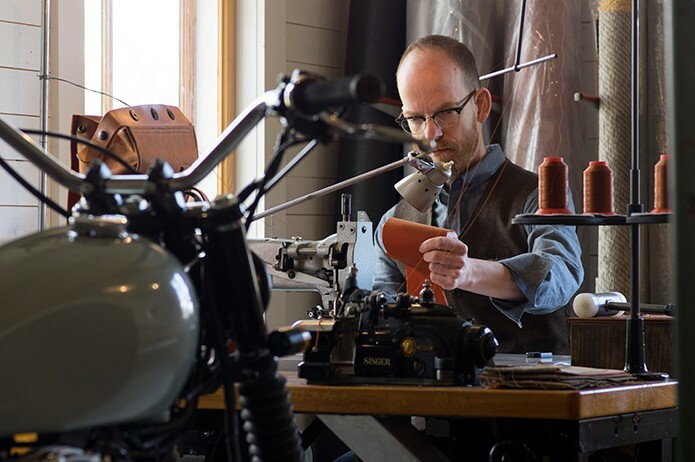 I realised that vintage sewing machines are much like working with motorcycles. My 40 square metre workshop would easily host all equipment I needed to make the missing bags from my history. Said and done – the whole sketching process and modelling of the first bag took six months of hard work, all published in real time on the blog. I carefully avoided to look at other bags during this process. I even refused to use helpful standard patterns and well known designs recommended by my friends. In this way I was sure to create something more unique. To help myself in this process I ordered the finest materials I could find: Ox leather from Sweden, waxed canvas from Scotland and buttons from Scovill. All parts were on the cutting table, and it was time to feel my way from test model to test model. A slow process of modelling, all revealed on the blog. My first bag was sold one week before it was completed, to a gentleman in USA. “I’m not done with the design yet” was my reply to his order. “Yes, you are” he replied. “I need the bag to be shipped directly to a motorcycle show in two weeks time”. We did not dare to send the bag to his home address, because it might be to tight for time. The first complete bag took a long trip over the ocean, and a metal mount was welded at a gas station the morning before the opening show. A swift paint job was done in the parking lot outside. 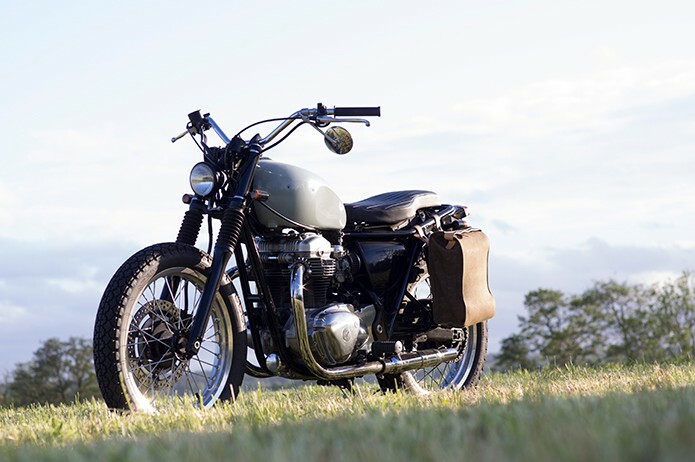 Farmer’s Racer was first introduced at The1motoshow in Portland 2012 – far from the red barns and the little workshop in Sweden. Provenance and authenticity are obviously key aspects to Farmer’s Racer’s ethos which can be seen in your choice of materials and methods of craftsmanship. Can you give us an overview of which raw materials are used within a Farmer’s Racer bag and how you have decided upon them? My goal is to keep the production as local as possible. Sweden is, though, a very small country, and we have lost many of our raw material industries. 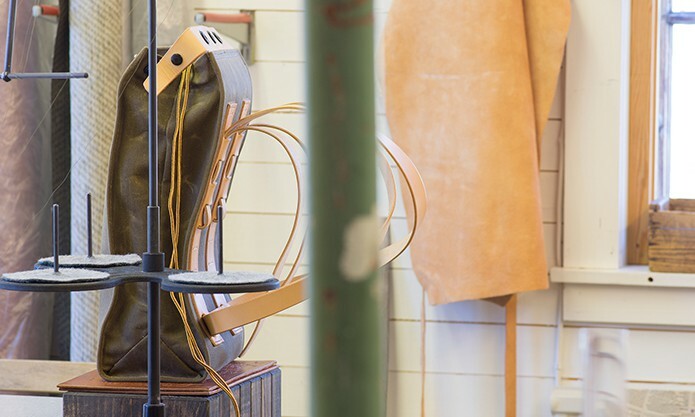 Only one of the materials of a Farmer’s Racer bag is made in Sweden, yet it is one of our proudest craft materials – the leather. 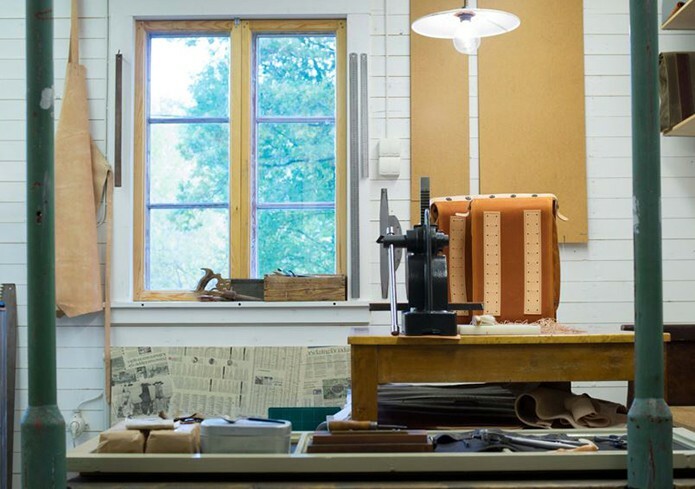 The tannery I have chosen is located outside Stockholm, called Tärnsjö tannery. They exclusively use a vegetable tanning process, which is both environmentally and user friendly. I have a personal contact with the professional tanners when I place an order, always making sure to deliver the right thickness and the best quality hides for the bags. Since the bag is showing both the top side and the flesh side of the hides, the process of choosing materials for my workshop is done with extra care by the tannery. Vegetable tanned leather is in many ways a living material. I have chosen to use un-dyed leather because the ageing process is a thrill to witness. 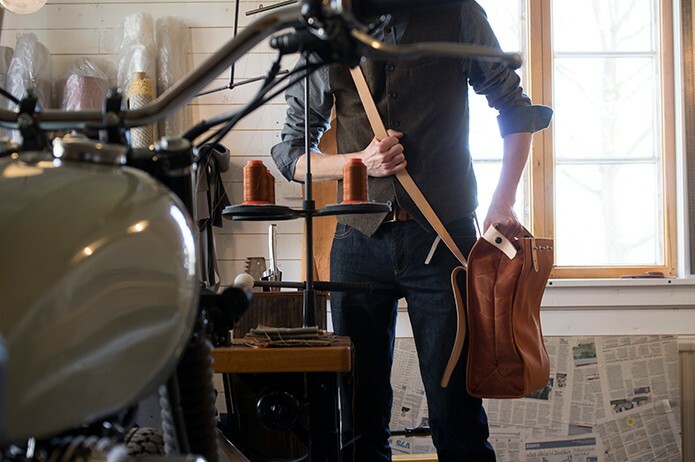 The crisp white leather of a new Farmer’s Racer bag will within only a few months turn into rich brown, with an endless variety of lines and shades. This is mostly done by the sun, and the contact of our own hands. 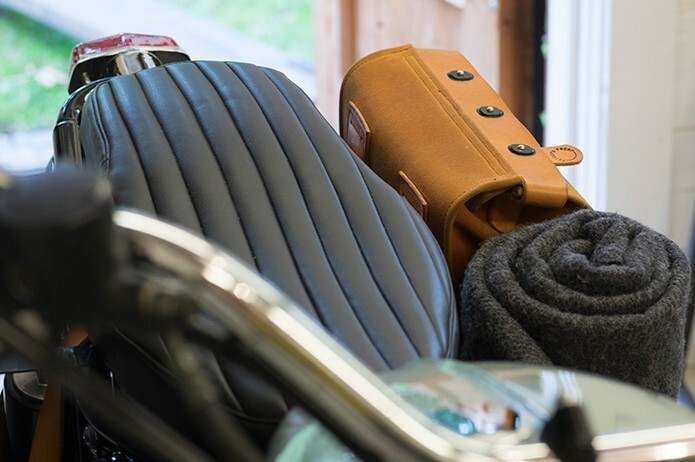 Each bag will take different shades, depending on sun, rain, our handling and our choice of leather care. The cotton canvas is delivered by one of the oldest waxing industries in Scotland. They have been in the craft since 1864. Their skills with cotton and wax are amongst the best in the world. 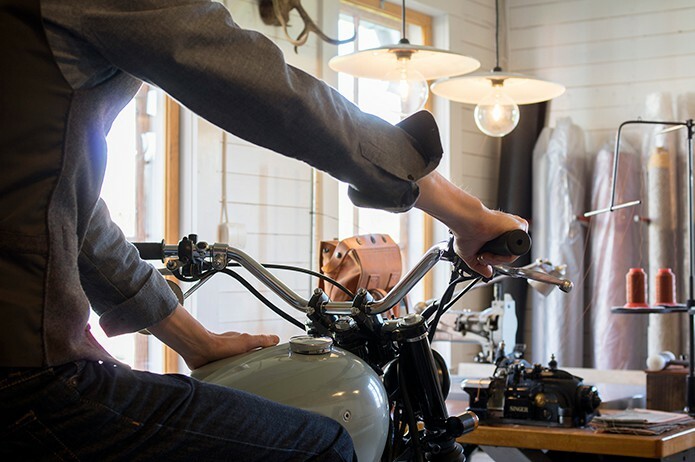 They produce many different waxed cotton materials, and farmer’s racer have chosen an 18oz waxed canvas. This is as close as it gets to the original way of combining these materials. The cloth is packed with melted wax, and the excess wax is pressed out of the cotton, creating a near water proof material. One square metre of waxed canvas weighs nearly one kilo. 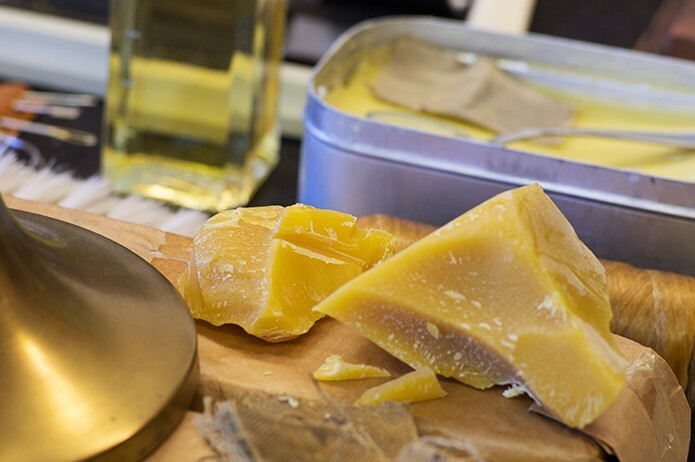 The all-through waxed surface is the most changing material over time. In the short perspective, all scratches on the surface will tell the owner what has been done with this bag today. 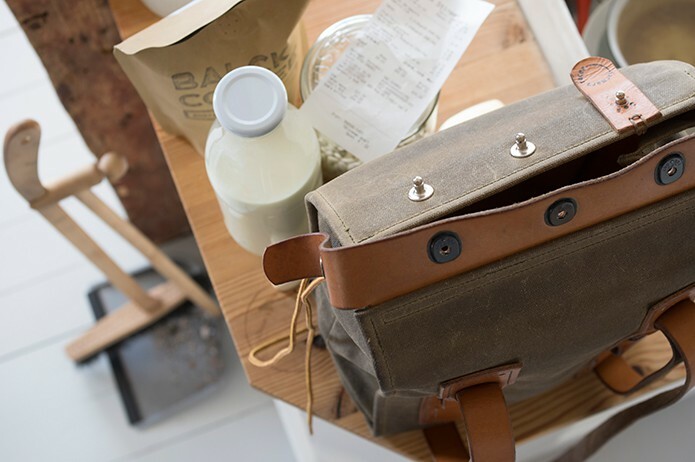 In the long perspective one can read if the user has the custom of resting the bag towards the table leg at cafés, being used as a backpack while riding a bicycle without fenders, or if the bag is usually is placed on the left side of a motorcycle. After day one of use this bags will evolve into totally unique bags for each owner. Buttons are delivered by Scovill fasteners. Their over size fasteners can be found on boat covers and car hoods. These small metal buttons are actually small wonders of engineering. Built into them is a small locking system, making sure that the fasteners will not open if forced to open in the wrong way. They are simply irresistible to a farmer with design skills. With these fasteners it is possible to mount a Farmer’s Racer bag to a motorcycle with the help of only two small metal buttons. The choice to use Scovill fasteners was easy to make, because they take away the most common reason to throw away a used bag: a broken zipper. Following on from this, can you talk us through the traditional machinery used to aid the crafting of a Farmer’s Racer bag? The first machine bought to the workshop was a Singer 29K. A foot powered sewing machine, common to most shoe making craftsmen. 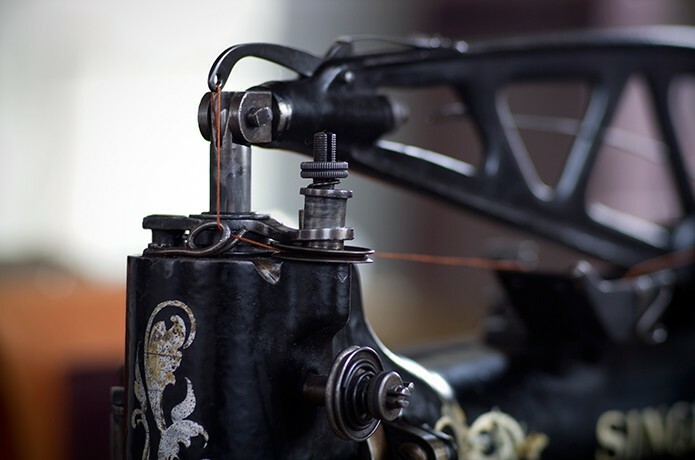 The first sketches, and the first ten bags, were sewn on this machine without the use of electricity. When orders started to drop in I understood that my feet would not keep up with the speed of shipping, so I turned electric. All sewing is now made by two machines. One straight stitch Dürkopp flatbed, and one Singer overlock. Both machines are adjusted to be able to handle thicker needles and thicker threads. They are also geared down, because I am in no hurry when making a bag for a customer. Both machines are working like clocks – old clocks. Always in need of care from me. And how does the location of your workshop in Ljungbyholm, in the forests of South East Sweden, add to the provenance and authenticity of a Farmer’s Racer bag? Well, I might not be the person to answer this question, since this is my home surroundings. I use the camera around me, and tell the stories from last Monday. Of most importance to me is that all words, pictures and bags leaving this little hill are authentic and true. I know that the Farmer’s Racer brand, and the place I tell my stories from, represent stillness and peace to many – not only customers from other continents. The red little house on the edge of the forest is in many ways the Swedish dream. A few years ago, some bloggers started to question the Farmer’s Racer’s credibility. There is a lot of brands out there, using working class aesthetics to reach urban customers. It still today warms my heart when I noticed unknown people step into the debate, telling the moderators that this little brand actually is true. There is really a farmer on a hill in Sweden making bags in a red little cabin. This is not a brand I have made – this is me surrendering to my heritage. Can you take us through the steps involved in the process of handcrafting a typical Farmer’s Racer bag? Handling the leather hides is a craft of its own. 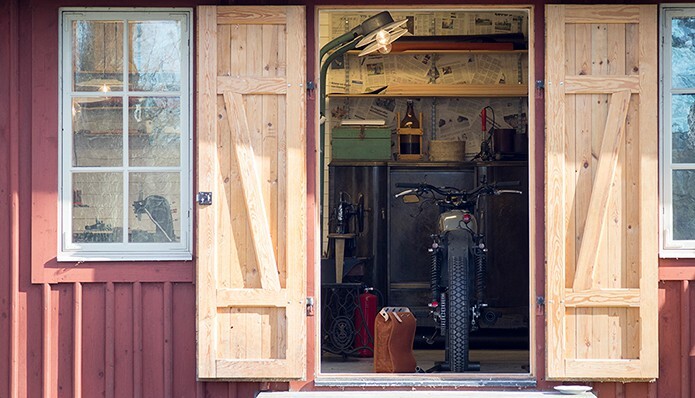 When delivered to the workshop, the hides measure 3 metres by 1 metre – far too big to store in the small cabin. 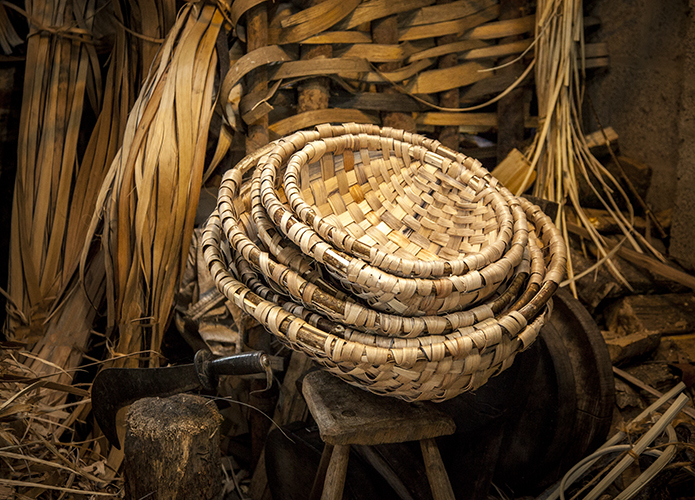 The leather parts of a Farmer’s Racer bag have different characteristics and are therefore cut out of different parts of a hide. The bag lid is the sturdiest part of a bag, and they are all cut from a ten centimetre wide belt closest to the backbone of the hide, reaching three metres in length. The straps are cut from an area reaching from the middle to the back of the hide. 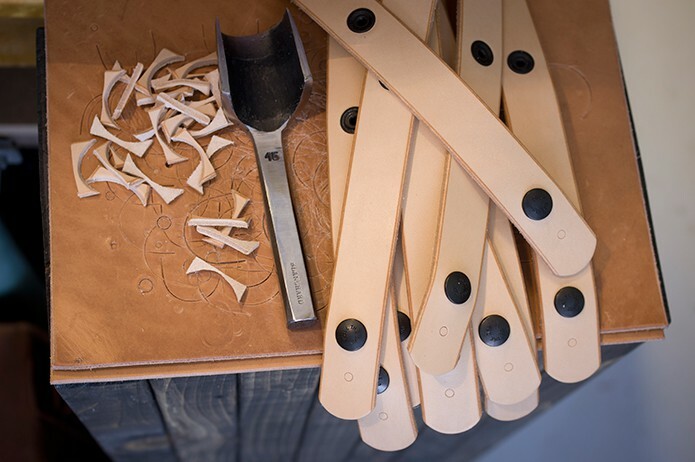 And the leather ladders, made to fit the straps to a bag, are cut from the middle towards the front and neck of the hide. This is the area with the most flexible leather – and it is perfect. The ladders will need to stretch to be able to braid the leather straps into a back pack harness. All leather cutting is done with knife and templates. Vegetable tanned leather is a dense material. 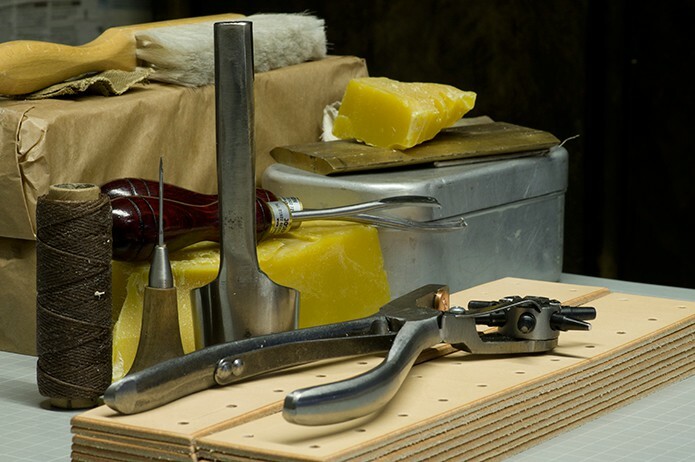 One can actually cut one self on a leather edge, and to prevent this, all edges are bevelled and hand polished with a cotton cloth and bees wax. After making 83 holes and slots in different leather parts for each bag, the surface is coated with Farmer’s Racer leather care. 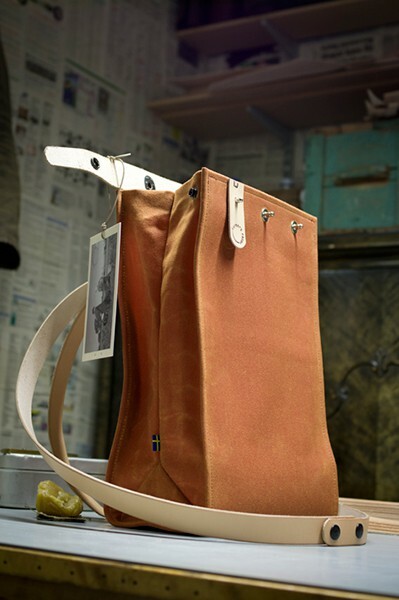 The sewing craft starts with folding a waxed canvas around the 2.5 mm vegetable tanned leather interior of the bag. The bag is made from one single sheet of canvas. Folded in a way similar to a parer bag – only this bag will last for generations. During the process of sewing all leather and canvas parts to a bag, every part is cut to fit the bag I’m making at the moment. When I start all parts are pre-made a little bit over-sized; while I’m working, all parts are fitted and adjusted to blend perfect together. As I am reaching the end of my work by the sewing machines, I face the most stressful part for both me and the bags – the turning. When sewing is done, the bag is inside out. And it is a sturdy bag with up to four layers of robust materials sewn together. My worries over turning has never diminished over the six years of turning bags. But the reward when I see the outside for the first time is as great as when I made the first prototype. It is now I can see that all the seams are placed correctly. I can see the distinct box shape, and the inside is ready to carry things. At this moment my craft transforms from carefully cut parts and materials into a bag. Always a short break after this stage, contemplating that this bag will find a user somewhere in the world. From now, the craft is all “downhill” and easy. Setting buttons and mounting tags and key strings, while whistling a tune. 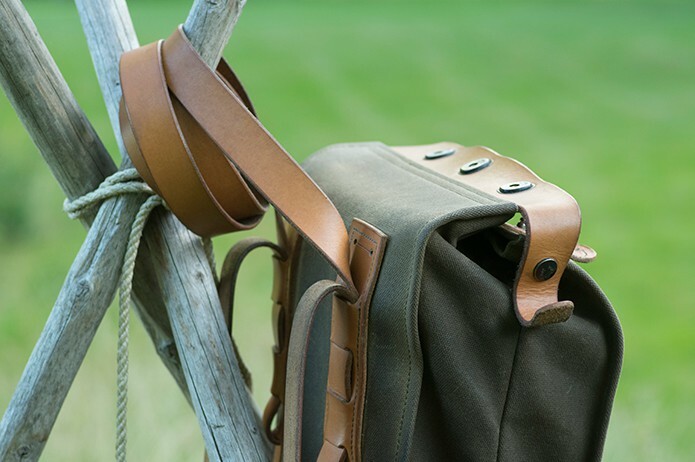 Due to the success and uniqueness of Farmer’s Racer bags, you have become a highly skilled and respected craftsman. Can you put into words what your craft means to you? To me, craft is a combination of three things. Before I go deeper into the three parts I would like so say that running a business is not one of them. The whole economy part of making and selling bags is an occupation of its own – not to be mixed with craft itself. 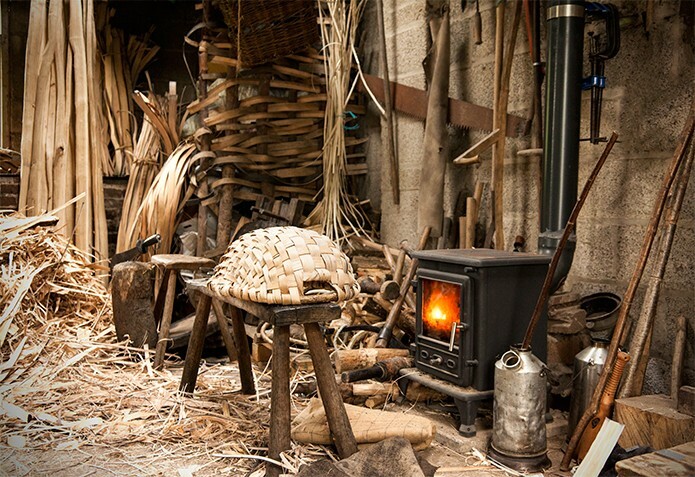 The three important things in craft are, the maker, what is made, and the user. This is what occupies my mind while making each bag. I have made many bags over the last six years, but it is each bag made that is important to me, and the user. 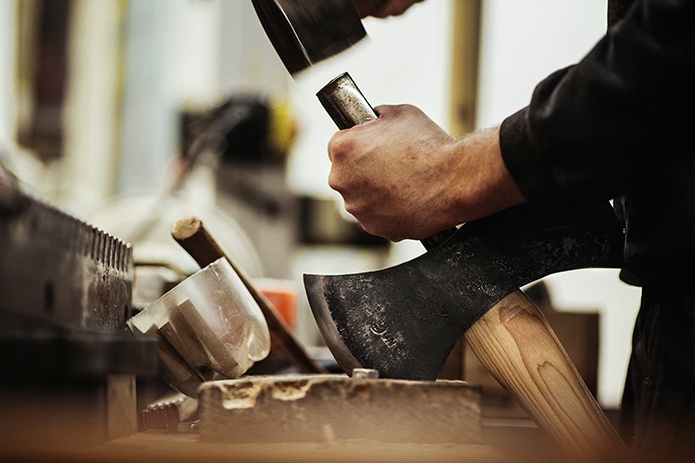 This strong bonds between the craftsperson, the materials and the customer, are the reasons why so many craftsmen are able, and willing, to make the same product over and over again. To me it is never the same bag. Each bag has a unique user somewhere in the world. The bag made yesterday is on its way to Tokyo. Meanwhile I’m talking to a local teacher about the future shifting colours of an orange bag. I don’t count my craft in numbers of bags – my craft is each bag. With you being the sole craftsman, there is a lot of practical and emotional investment in each of your bags, and time seems to play a huge role in the labour intensive process of producing a Farmer’s Racer bag. Time and emotion also seem to be important parts in the end-use of the bag. You have described your bags as being a customer’s ‘last’ bag, accompanying them through life… Can you articulate to us the importance of longevity and emotional, as well as practical, function in your pieces? The origin of longevity thoughts are based in my roots as a farmer. Good thoughts and good things should be passed down from one generation to the next. A grandfathers bag is more than just a bag. And if the grandchildren choose to care for the old bag rather than buying a new one, it is the most sustainable design I could think of. 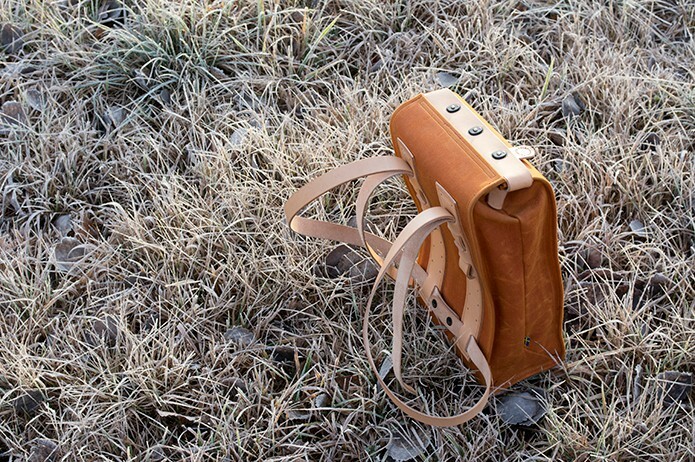 Creating a bag that the user would like to care for over a life time, has transformed my choice of materials and designs from a broad road of possibilities to a narrow path of selection. I selected materials that need attention from the owner. Attention in form of waxing and leather care. In this way the bonds between the bag and the user become stronger. In addition the bag will change over time – patina and stains will tell a story about how the owner has used and cared for the bag. After six years of use I can only guess the aesthetics of a 40 year old bag – but I can provide the materials and craftsmanship to make the bags last for years and years. Providing the materials is one way to make the bags last. Cutting out weak spots is another. No delicate interior and no pockets is adding decades to the ageing possibilities. When I talk to owners who have used their bags for a few months, they often worship the solo compartment. “It is easier to find something in one pocket, than searching around in twelve.” No zippers and no quick fix strapping system is also adding years of use. The slow, five button opening, and the slow adjustment of straps, is done with pride and finesse after some training. It will take some time to learn this bag. 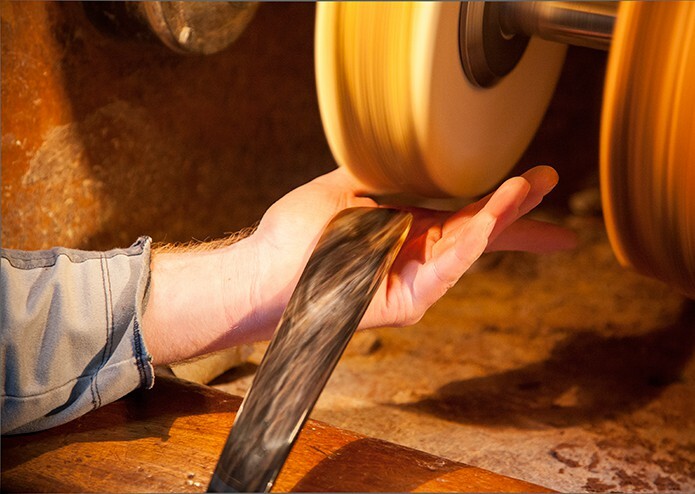 Just like it will take some time to learn a pair of new raw denim jeans, or hand made shoes. While we are learning we are creating a relationship over time. The key strength of Farmer’s Racer bag is its rugged long-lasting multi-functionality, often missing within contemporary transient-trend ‘niche’ products. Can you describe your customer base, and why your bags seem to resonate so well with people? This company is small, and production is small. I have personal contact with most of my customers. Even if the buy-button in the webshop is automatic, many customers send a mail to, just in case. And I have learned a lot from the owners of Farmer’s Racer bags. One common thing is the combination of patience and selectivity. Most customers has followed Farmer’s Racer for a long time – not rarely more than a year. This slow growing company is connecting to patient customers. People like to know how things are made, by who, and why. It takes a while to tell this story over the internet. Buying a Farmer’s Racer bag is a selective choice, or even a statement to some. There are only a handful of variants of Farmer’s Racer bags, their multi-functional simplicity and timeless aesthetics being simple, yet utterly effective, selling points, yet, as it is still such a young company (albeit rooted in ethos of heritage and tradition), how do you think Farmer’s Racer will evolve over time? Thanks to Lars Gustavsson for taking time out of his busy schedule to answer our questions. All images courtesy of Farmer’s Racer.